StarGenetics exercises are written using an Excel Workbook. StarGenetics on support XLS format (Excel 97-2004), to save exercise in XLS format use "File->Save As...". By modifying the Excel Workbook you can generate new source files for exercises that you design. The Excel Workbook contains all the instructions you need to modify and build new exercises. All the visualizers available for StarGenetics (Cows, Fish,Fly,Peas,Smiley Face, and Yeast)use versions of the same Excel Workbook. Each workbook associated with a visualizer provides various examples of how to specify genotype and phenotype relationships and gene interactions in StarGenetics. In addition, StarGenetics supports the use of DNA markers for genetic mapping. 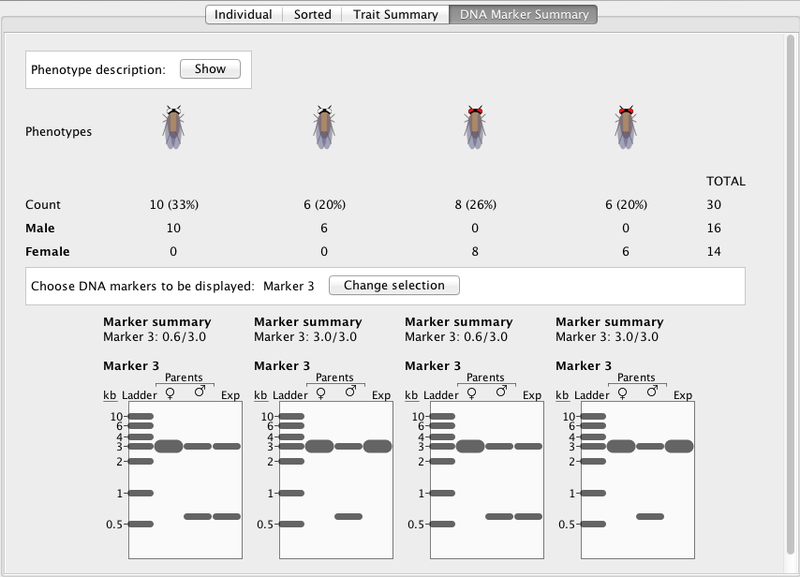 DNA marker functionality is available in both theFly and Fish visualizers.